Just 50 kms south of Salzburg, Dachstein West is a haven of peace and a great place to escape the hustle & bustle of modern life but also has lots of sporting activities to satisfy everyone. In the Winter 140 kms of ski runs are serviced by more than 40 lifts. The season runs from the beginning of December to the beginning of April. There are more than 20 mountain huts and restaurants to choose from and the ski school has a great reputation especially with children. 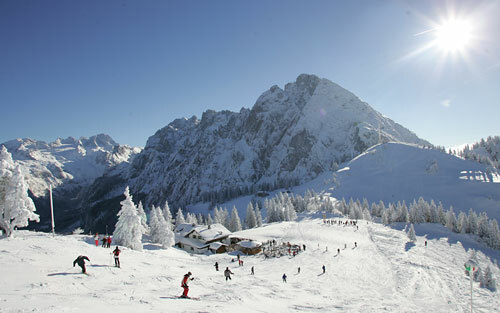 Pistes are much less crowded than other larger resorts and give spectacular views of the surrounding peaks. Horse drawn sleigh rides are also available as well as 45kms of cross country skiing - tobogganing and plenty of cleared winter walks. In the Summer, the natural beauty of the mountains and Glacier lake come in to their own. There are many places to visit in the area including the Gosausee Glacier Lake - the lakeside village of Hallstatt ( a world heritage site ) - the Giant Ice caves at Obertraun (accessible by cable car) - the salt mines at Hallstatt - the beautiful village of St Wolfgang plus numerous picturesque lakes. Mountain biking is popular in the Summer months and the area boasts more than 400km of well signposted cycle paths. For hikers and walkers there are 250 kms of paths ranging from easy strolls to difficult ascents. A cable car operates in the summer up to the Zwieselalm with stunning views of the glacier lake and glacier. Fishing and Horse riding are also available. pretty villages, just 50km from Salzburg.